Baptism is an important part of our ministry and we operate an open policy, which means that all are welcome. Baptism services take place by prior arrangement, usually on Sundays either during the main Sunday service or early afternoon. Other days and times are available - please feel free to ask. 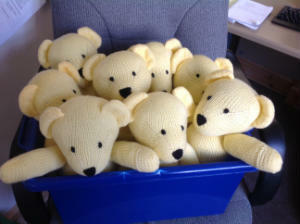 Prayer Bears (shown above) are ready to go to those who are baptised in the Avon River Team. They are knitted by a member of the church and, along with a candle and cards, are given with the request that they are held at prayer times. Please click here for a useful booklet about Baptism.